With the Stanley Cup, Calder Cup, and the Kelly Cup all up for grabs this week…. just a quick update on all things hockey before EVERYONE joins the hockey off-season mode. 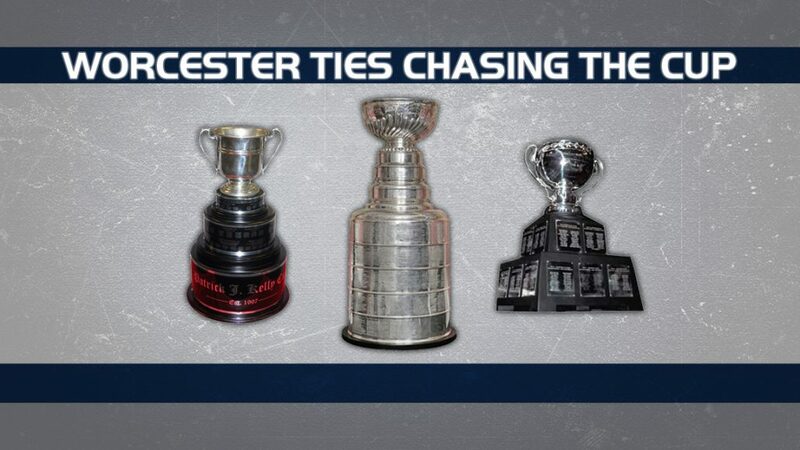 There are six teams left in the three major hockey leagues (NHL, AHL, ECHL) and there are some Worcester connections worth taking a look at…. so, let’s dive in! VEGAS– Former Worcester Sharks forward Ryan Carpenter has five points (0-5-5) in 14 playoff games with the Golden Knights. Carpy had 15 points (9-6-15) in 52 games with the San Jose Sharks/ Golden Knights this season. Former Worcester Sharks head equipment manager Chris Davidson-Adams is now the head equipment manager for the Golden Knights and now has an opportunity to raise the Stanley Cup – how cool is that! WASHINGTON– no players with a direct connection to Worcester…but there are plenty of familiar faces that Worcester hockey fans will remember as there are a lot of former Hershey Bears (the AHL affiliate of the Caps) on the roster. Caps forwards Jacob Vrana and Chandler Stephenson each played in the Bears 10-4 win over the Worcester Sharks in the final ever game for the Sharks on May 1, 2015. In addition, Railers president Mike Myers grew up a huge Capitals fan growing up in DC…Myers also designed the mask of the Caps goaltender development coach Olie Kolzig. TEXAS– Worcester Railers goaltender Mitch Gillam signed a PTO with the Stars during their second-round series to act as a Black Ace. Gilly was released after the Stars ECHL affiliate, the Idaho Steelheads were eliminated from the Kelly Cup playoffs. Texas plays in the Pacific Division – the same as the SJ Barracuda. Texas Stars GM Scott White was the d- partner in college with Jamie Russell. TORONTO– Marlies forward Ben Smith won a national Championship with Barry Almeida at Boston College. Smith also played for the San Jose Sharks in 2014-16 and the SJ Barracuda. FLORIDA– The Everblades took down the Adirondack Thunder in five games in the Eastern Conference Finals and former Worcester Sharks defenseman Gus Young has nine points (2-7-9) in 16 playoff games for the Everblades. The Railers defeated the Everblades 3-2 at the DCU Center on Jan 28 in the only meeting of the season between the two clubs. COLORADO– Eagles defenseman Collin Bowman attended training camp with the Worcester Sharks as Colorado looks for their second straight Kelly Cup title before joining the AHL next season. The Railers and the Eagles combined for an ECHL season high 182 penalty minutes on Oct 25 in the Eagles 5-1 win over Worcester.